Fashion Men Outdoor Travel Backpack. Large capacity and multi-layer design, which can hold lots of things, such as laptop, phone, wallet, clothes and other items. Anti-theft design, the dual zippers with combination lock can keep your essentials secure. And it is equipped with an external USB charging port, which allows you to charge your mobile phone at any time. Good quality material, water-resistant and wear-resistant, not easy to be damaged. 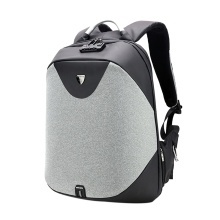 Large capacity and multi-layer, which can hold lots of things, such as laptop, phone, wallet, clothes and other items. Anti-theft design, the password lock can help you prevent the thief, keeping the inside items safe. Equipped with external USB charging port for conveniently charging your mobile phone. With anti-theft card pocket on shoulder belt, the card can be placed safely and conveniently. Ergonomic design, breathable and lightweight, comfortable to wear. Designed with facilitate keyring and aluminum handle, also designed with Reflective Strip to keep you visible in the dark. Three-dimensional design, fine workmanship, exquisite and fashionable. Perfect gift for men, suitable for any outdoor activity like travel, camping or daily use.